You don’t have to be a fan of Keeping Up with the Kardashians or Botched to know that there’s a whole lot of cosmetic procedures going on…just take a look around you. If the statistics are any indication — and they most certainly are — the appointments being booked aren’t just for celebs and socialites. Those that partake come in all shapes and sizes as well as from different racial and ethnic backgrounds, income levels and careers. They do it to improve what they perceive to be imperfections so that they can feel better about their appearance or improve their social lives and/or job opportunities. Statistics from the American Society for Aesthetic Plastic Surgery show that over the past 15 years, surgical procedures have increased by 73% while non-surgical procedures have increased by a whopping 356%. These are huge numbers! 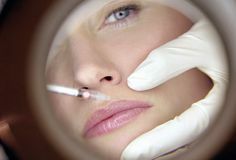 With injectables like neurotoxins and fillers, lasers, plastic surgery and the like continuing to rise, it’s no surprise that those who do indulge would want to cut down on the swelling and bruising that comes with the territory. But, is that even possible? “Individuals swell and bruise at different rates mostly because of the wealth of the blood supply each person has in that particular site. In general the face and hands have the most robust blood supply, and hence swell most. The good blood supply also affords faster healing and better scarring,” says renowned New York City-based plastic surgeon Dr. Robert Tornambe M.D., F.A.C.S., who specializes in the face, breast and body. He goes on to explain that swelling is a normal part of the healing process since any trauma can set off the body’s immune system and healing process. The way it works is blood (which carries nutrients and clotting factors) is shunted to that area causing it to swell but also bringing the necessary components to allow healing. Bruising is the result of more blood to the area, but does not have an effect on healing. Patients who are taking aspirin or blood thinners, or those who have recently had certain foods (including some types of mushrooms often found in chinese food) before surgery will bruise more readily as will other patients for no other apparent reason than a genetic component. Turmeric, honey and cinnamon are natural anti-inflammatories. Take in moderation. Though there is no hard scientific proof some people find echinacea effective to decrease bruising. Elevate the area as much as possible for the first 48 hours to decrease swelling. Ice therapy will help with swelling. For the first 48 hours post-treatment apply ice pack 10-20 min on, 20 minutes off, repeat. After 2-3 days post treatment, warm soaks can help minimize bruising. So there you go. Ingest natural anti-inflammatories and echinacea, elevate the area, ice on/ice off for the first 48 hours followed with warm soaks means less time hiding under big glasses and burkas and more time out there strutting your new and improved stuff!